North East social housing provider Hellens Residential has brought six new Rent to Buy apartments to the market in Darlington with support from Homes England. The newly constructed three-storey apartment block, which is located two miles east of Darlington town centre at Lingfield Point, was completed by Taylor Wimpey last week and officially opened by Councillor Jenny Chapman, MP. The six two-bedroom apartments form part of the popular Millfields development, a major housing scheme in an area which has undergone significant regeneration in recent years. Kate Hellens, managing director of Hellens Residential, which is based in Washington, said: “We are delighted to release these six new apartments at Millfields and have already received a significant level of interest. In June we successfully launched our first three Rent to Buy apartments at the scheme, which proved to be very popular and were let within a very short time frame. The Rent to Buy scheme is available to working households at an intermediate rent to give them the opportunity to save for a deposit to buy their first home. The six new apartments will be offered at an intermediate rent for a minimum of five years. After the initial five years of letting the tenant has the opportunity to buy their home at market value. Tenants are not required to purchase the property after five years and can continue to rent however at normal market rent. The Millfields apartment block comprises two apartments on each floor, which each feature a galley kitchen, open plan living room, two bedrooms, a modern bathroom and allocated car parking. 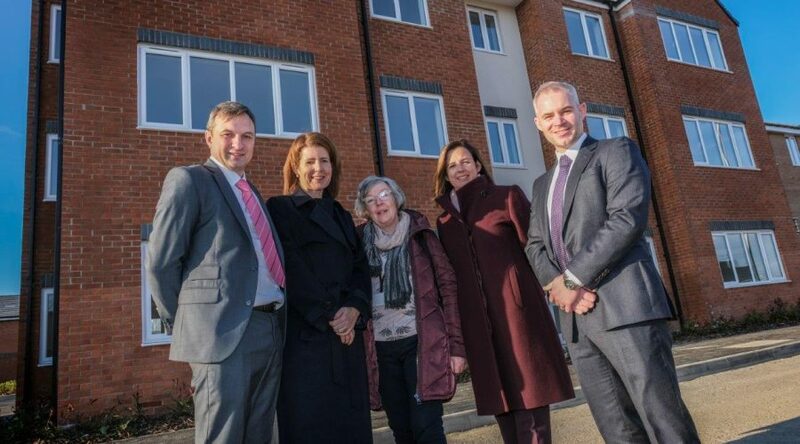 Darlington MP Jenny Chapman, added: “It was a pleasure to meet with the team from Hellens at the Millfields development on Lingfield Point and have a look at their recently completed build. Hellens Residential, which has an affordable homes portfolio exceeding 150 properties throughout the North East, received funding from Homes England under the SOAHP 2018-21 programme in order to deliver these properties. Elsewhere in Darlington, Hellens Group is working to deliver Burtree Village, a strategic site located at Faverdale. The site is an allocation in the emerging Local Plan, providing 2,000 homes and 200,000 sq m of employment space. Hellens Group is working with Darlington Borough Council to shape the allocation to provide a mix of much needed starter and family homes as well as employment space to support jobs and growth within the region. Gavin Cordwell-Smith, chief executive of Hellens Group, said: “It is Hellens’ ambition, with the support of Hellens Residential and Homes England to deliver 500 of the new homes as affordable homes. This will significantly strengthen the offer of affordable homes in Darlington, providing a greater choice of homes to meet a wide range of needs.